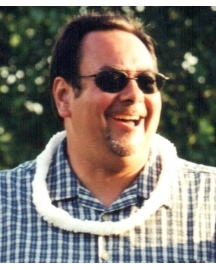 Brian Paul Almeida, aka Nick Danger, 58 of Bristol, RI died suddenly on March 12, 2019 in New London, CT. He was the husband of Kathryn (Smith) Almeida. Born in Fall River, MA, Brian grew up in Newport, RI and was the son of Rudolph Almeida (Charlotte) of Edgewater, FL and the late Dolores (Slivecky) Almeida. Brian graduated from Florida Institute of Technology in 1983. He began employment as an engineer for General Dynamics, Electric Boat Division in Newport, RI in June 1985, working also in Quonset and Groton. He was a certified Six Sigma Black Belt Process Engineer at the time of his death. Brian was very active in Bristol youth sports, having coached for the Bristol Youth Soccer Association, King Philip Little League, St. Elizabeth’s CYO Basketball League, and was on the “chain gang" for Mt. Hope Huskie Football. Brian’s Zen was on the water. When surrounded by blue space, Brian found peace and happiness. Brian enjoyed excursions to the Newport Jazz and Folk Festivals on his boat crowded with family and friends. He also enjoyed fishing in the area waters and trips to Martha’s Vineyard. Brian took great pride in his annual vegetable garden. His gardening expertise produced abundant harvests, which he was able to share with a local soup kitchen. The undisputed chef of the family, Brian created quick and delicious dishes for family and friends. Brian was a skilled handyman, finishing the upstairs of the family home and building an addition with the help of his friends. Brian was always willing and able to help a friend in need, whether for a home project, yard work, or advice. In addition to his wife of 29 years and father, Brian is survived by his son, Ian Almeida of Bristol, and his daughter Zoe Almeida of Providence, brother Wayne Almeida (Cindy) of Calabash, NC, sister Sharon Fairclough (Mitch) of Longs, SC, and brother Mark Almeida (Kathy) of Gilbert, AZ, and numerous nieces, nephews, cousins and lifelong friends. His quick wit and sarcasm will be sadly missed by all who know him.